Hire our tree services today. At Brazos Valley Stump Grinding and Tree Services, professionalism and accountability are the cornerstones of our business model that is designed to take the hassle out of tree services and stump removal. We will be there on time and our services will cost what we say they are going to cost. This is a very basic principal of business that seems to be lost in today's business world; especially construction related business, and is something that we take great pride in. If you're looking for a reliable company for tree service in College Station, TX and Bryan, TX, we are the company to trust. Give us a call today! We have separate construction crews that handle stump removal services and tree removal services. We employ cutting edge stump grinding technology via the Carlton SP4012 Grinding machine which we can use to quickly turn your obtrusive stump into the equivalent of saw dust. This machine gives our customers a very affordable means of stump removal. We offer professional tree removal services! Our dedicated team can grind up to 12 inches below ground level to completely rid of stumps and with a 35 inch wheel base. We can easily get into back yards and tight areas that many machines can't reach. Whether you have one stump or one hundred, no job is too small or too large for us to handle. Our tree service crew does nothing but tree service, including tree removal and trimming, tree shaping and pruning and stump removal. We specialize in live oak and post oak trees which are dominant in the Brazos Valley. Give us a call today for quality service in College Station, TX and the surrounding area! We are quick to respond to service requests and our crew has many years of experience in tree removal services. Whether it is your home property or a business, we are prepared to handle any tree services needed. Attempting tree removal by yourself is dangerous and potentially life-threatening. Don't risk your life by over-extending yourself to clean up your property. 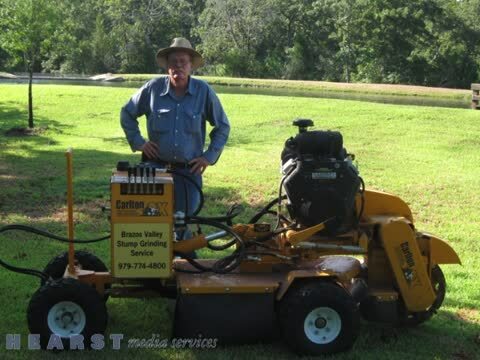 Leave the hard work for Brazos Valley Stump Grinding and Tree Removal. Stump removal made fast and easy. “We do what we say we are going to do, when we say we are going to do it.” That isn’t just a saying. We conduct our business according to it. That means if we give you a quote for a job, we will stand by our word. It is our goal to earn your business through our friendly, experienced staff. So give us a call today for your stump removal, tree removal and tree service needs and let us do the job the right way. We offer free estimates for all services and we have a very competitive pricing structure. We are bonded and insured and we look forward to servicing you! Proudly serving the College Station, TX and Bryan, TX residents.